Here's a question for you. What percentage of food produced never gets to the belly because goes into the garbage? Think about it for a minute. There are a lot of places to trash food. Farmers won't ship a lot of their blemished yield because it won't sell. Some food gets damaged in transport and storage. A large percentage of produce and meat just doesn't sell at the supermarket. A lot of people don't eat what they buy or toss out what they cook. Check out the garbage at a restaurant some time. There is a lot of uneaten food there too. "Between 30% and 50% is wasted." The UN backs up his number at 33%. When you consider 1 out of 8 people are chronically undernourished (The United Nations Food and Agriculture Organization, 2010-2012) the math works out that we have no trouble feeding every one on this planet- and a couple billion more. As a world, we seem to be forgetting the Golden Rule of doing unto others. While chronic undernourishment is reserved for the poorest of the poor (1,400 million people are living under $1.25 a day (World Bank 2008)), Canada and the USA also face hunger issues. In Canada,a comprehensive study on hunger called HungerCount (2012), asserted that close to 900,000 Canadians use food bank each month. About 400,000 of those folks are children and youths. According to Feeding America, 1 in 6 Americans face hunger. With stats like these, it is clear that there is an ongoing need to support charities. This takes us to some of the best charitable organizational experiential marketing that I've ever seen. It comes from a Vancouver based organization called Five Hole for Food. I heard about Five Hole for Food when I was grabbing a lunch with a friend of mine. He said, "I hear there is a street hockey game downtown today. If you bring your hockey stick and a non-perishable you can play...." I thought it sounded cool, so I grabbed 2 buddies and went. 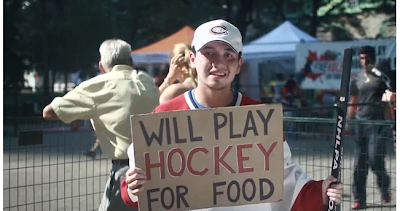 The idea behind Five Hole for Food is a simple (and very Canadian) one: Raise food donations for the local food banks through an organized street hockey games across Canada. With the help of Telus, ING and other sponsors, Five Hole for Food organizers travel across Canada (St John's, Halifax, Charlottetown, Montreal, Ottawa, Toronto, Winnipeg, Regina, Calgary, Victoria and Vancouver), and set up and organize street hockey games in visible sections of each city. Local volunteer street hockey players show up with a hockey stick and a non-perishable food item. The non-perishable item is the "access pass" to play. The hockey stick is needed, of course, to participate in the the self-regulated game. The game has Five Hole for Food sweaters and "hockey boards" branded with "Five Hole for Food" and the local food bank signage. The game attracts a crowd given its novelty and location. After a day of drop-in game play, Five Hole for Food gets the players remaining to participate in a video, "We are --- city name ---. We will play hockey for food." 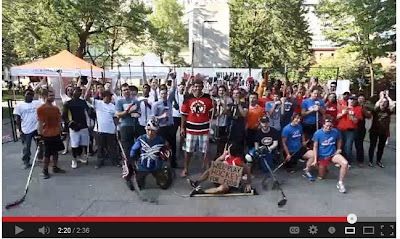 Check out Montreal's shout out at the end of the video. In its 4 years of operations, Five Hole for Food has collected hundreds of thousands of pounds of food. This comes at a time when many food banks complain that donations have been at 50 year lows (see articles: desperate for donations, running out of space, food, help). But what impresses me is the foundation upon which this new brand non-profit organization can have impact and grow. Five Hole for Food has partnered with local food banks in 9 cities across the country. From a branding perspective, this means that Five Hole for Food has leveraged credibility from the local banks and has established roots to form a national brand. If Five Hole for Food continues to execute well, it will likely be invited into other communities - enhancing its brand penetration and growth. From a brand strategy point of view, Five Hole seems to have aligned each relevant party's interest. From the food bank perspective, donations are cyclical, swell around Christmas time and deplete in the summer. By organizing in games and food donation drives in the summer, Five Hole for Food moderates this food depletion and heightens awareness to the year-round problem of hungry people. From a city point of view, what city would not want to donate a block of land to raise thousands of pounds of food for its disadvantaged cities? (Privately, organizers told me of some struggles that the organization had with city hall in two cities. Shameful.) And, from the participant point of view, it is a lot of fun in a making a difference. In my workshops, I often drive at the point that there is no better way to create a strong brand than via direct experience. This is something that many charities (and even for profit) brands do not get. My interactions with a lot of charities that I donate to is really an annual call, "can you donate some money?" But get a group of people together who love doing the same thing- and doing it in the spirit of helping others... that's a feel good experience. 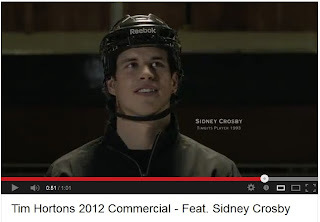 Mix in hockey for a Canadian and there is a deeply patriotic emotional experience. As if reading my mind when we walked by the mountain of food at the end of the day, one player said to me, "Wow! That's a lot of food for a lot of people. And it was so much fun to play. I can hardly wait for next year. What about you?" I responded, "Next year, I will be back to play hockey for food." Ever wanted to know which retailer kicks off the Christmas shopping season first? I might have the answer here. That's about 5 weeks before Thanksgiving (Canada), 2 months before Halloween, and 109 days before Christmas. "I don't like it when retailers push seasons on to me so early...Call me old fashioned but Christmas belongs in December and Valentine's Day belongs in February. Displays like this blas é ‎ my special season shopping experience. I wish these marketing guys could understand that... I am still buying back-to-school stuff." We wished each other a Merry Christmas to each other at Costco at the start of September. 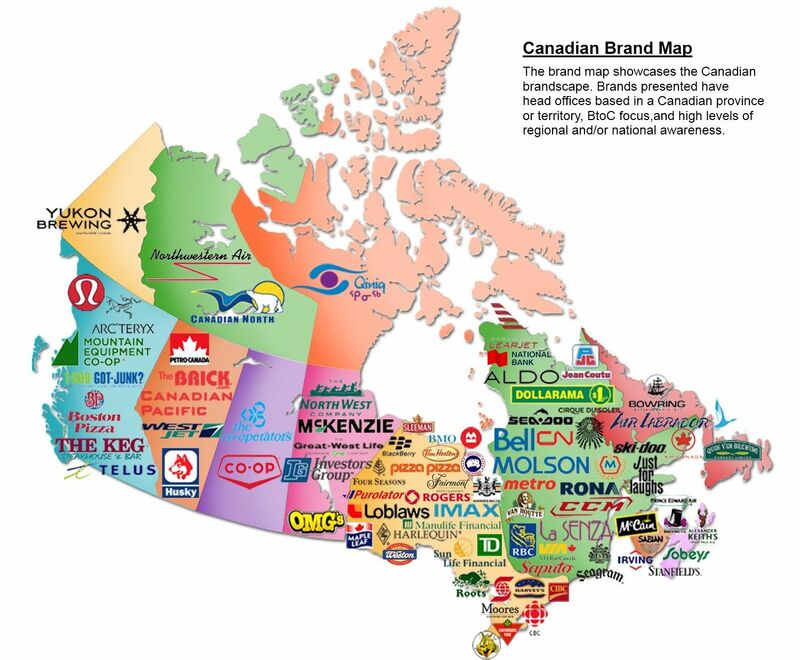 Remember our Brand Map of Canada? The survey randomly scrambled the order of brands. The sample spread via social networks. More than 330 responses later I looked at the results. Now, I am not saying this is a scientifically valid study, but I am arguing that it gives a pretty good pulse of the mindshare and heartshare of Canadian respondents. Here's something else that is interesting- check out the other leading brands. Notice a common trend here in the names: Canadian Broadcasting Corporation, Canadian Tire, Molson (Molson Canadian), Petro Canada, RBC (historically, Royal Bank of Canada). 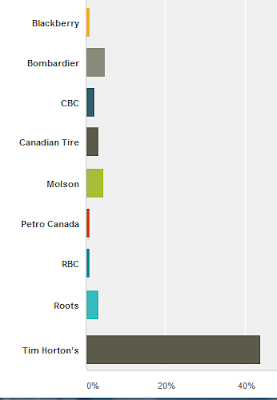 Add Roots with its beaver logo, and you can see how these brand elements (names, logos) fuel Canadiana. But Tim Horton wins without any of this. The brand doesn't have the name Canada in its name or a maple leaf or beaver in its logo. 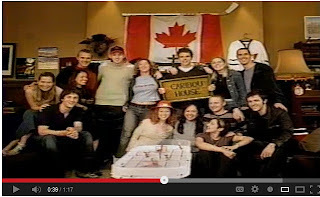 So where did the brand's Canadianess come from? There are many ways to answer this, but I will keep it simple by highlighting 3 things. First, there are 3,453 Tim Horton's in Canada. That's a lot. There is a Tim Horton's for every 10,000 Canadians. Let's put Tim's in an international context. There are 14,000 McDonald's restaurants in the USA. To match Tim's consumer penetration, McDonald's would have to grow to about 32,500 locations in the USA . Second, Tim's is wildly linked to hockey- "Canada's game". From Timbits minor hockey sponsorships to Hockey Night in Canada (the most watched show in Canada) - Tim's brand is endowed with hockey. 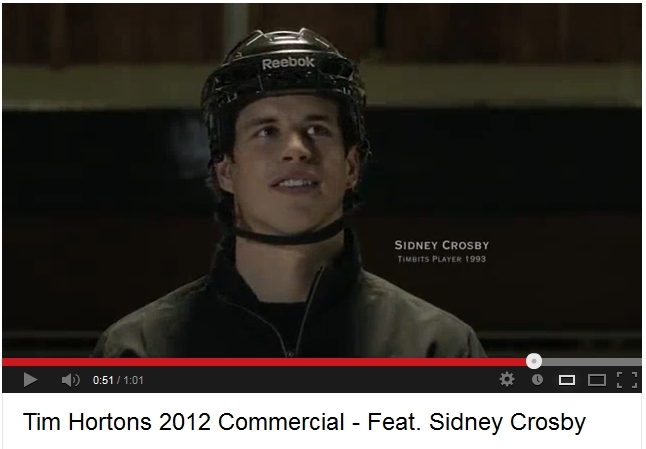 It also doesn't hurt that Tim Horton himself was a pro NHL player from Canada- and the best play in the world - Sidney Crosby is a spokesperson for the brand and former Timbit hockey player. So with its Canadian roots and links to the community through locations and minor hockey sponsorship, Tim's found itself inside the Canadian psyche. And now, the Canadians themselves tout just how Canadian the brand is. Tim Horton's of course, is proud to promote these homegrown Canadian stories, which add a good dose of authenticity to the Canadian side of the brand. So Tim's gets our award for the National Brand of Canada. And its not hard to see why.